Another Five star review on Google for our latest Reformer pilates studio based in London E1/ Shoreditch 5 min walk from Shoreditch overground station, Shoreditch house and red church street with all it’s boutique shops. The Snake (also referred to as Snake/Twist) is a complex exercise originally done on the Reformer. It requires skill, great control and coordination of the body and mind. And by mind I mean the desire and will to do this exercise. The Snake is a Compound Movement integrating upper and lower body with a spine twist. • Firmly place your top foot/heel on the foot-bar and bring the bottom leg in front and cross it over. SIX PRINCIPLES used in the Tempo Pilates method in all our London reformer classes are as follow. Flow: The aim in our reformer classes is to create a flow of movement in our exercises; ease, grace and fluidity are imperative. The mind-body connection entwines all body parts in a parallel manner. 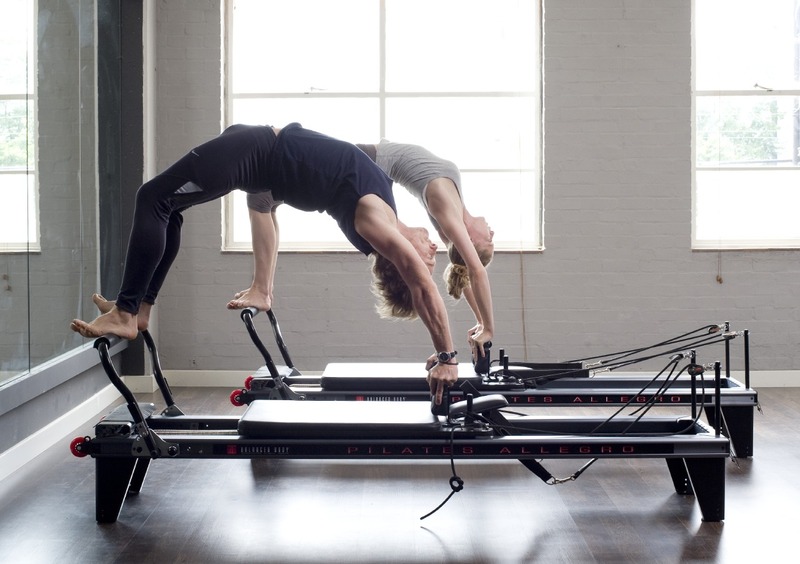 Pilates equipment such as the reformer can be a mirror of one’s flow as they tend to be quite maladroit – if one loses flow the session can become “machine-like”. Centring: This brings a focal point to the centre of the body in the powerful, dynamic area that lies between the lower ribs and pubic bones. As far as energy goes, the source for Pilates comes from the centre. By centralizing your powerhouse sector, one can isolate and move parts of the body while keeping the rest stable. Breath: Some Pilates lovers consider this principle to be one of the most important. Breathing supports the oxygen released in tense muscles, higher concentration and muscle stability. Heavy chest breathing tends to overwork the superficial breathing muscles that lead to tenseness; low breathing into the deep belly relaxes the abdominal wall, which may lead to back injury. Inhale through your nose deep into your ribcage and back followed by long and controlled exhales. Most Pilates classes integrate breathing into the exercise, so it is no wonder why students believe this is the most vital principle. Concentration: Absolute concentration is required to maintain the stability that is the core of Pilates – while improving flexibility, if complete attention and commitment is brought to the exercise, maximum profit will be acquired from each pilates movement. Control: Entire muscular control should be executed with each move to avoid potentially hurtful swinging or bouncing on the Pilates reformer machine. Using movement control, you can also improve the neuromuscular system and the balance in your body. Precision: Awareness is nourished throughout each action; there is always appropriate placement and alignments that are relative to other body parts and are trajectory for each part of the body. If exercise is practiced with precision, your own perception is guaranteed to improve. Now that the 6 principles have been unveiled, it is time for you to take these tips into the studio for amazing results! Join a Tempo Pilates reformer class, book now at East London E8/ Hackney or E1/ Shoreditch, Central London WC2/ Covent Garden. Whoop…Five star Google+ review for our London E1/ Shoreditch reformer pilates studio.